And here come the Valentine's Day scrambles — that hectic pre-holiday period where, if you're a decent human being, the quandary of what to get your innamorato (or innamorata, as the case may be) almost outweighs the joy of being with someone you love on this oh-so-special day. Almost. If it so happens that a techie (or anyone with taste) is the apple of your eye, we can take care of that pesky gift issue right now, by offering the reader who woos our hearts with the best Valentine's Day poem this handsome, brand-spankin'-new Vintage Love DODOcase or Love Me DODOcase for V-Day gifting. Made for iPads or Kindle Fires — the winner gets to pick his or her poison! 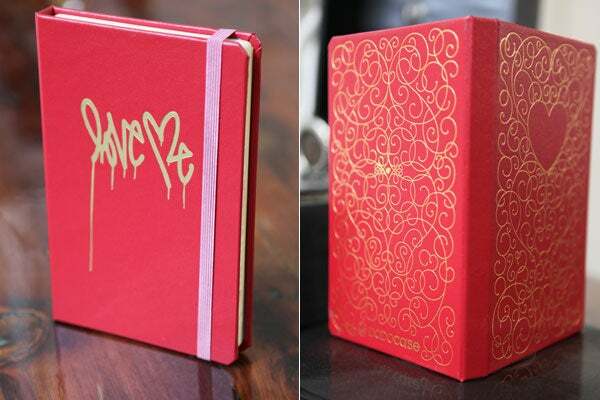 — the cases are structured and red-leather-bound, thanks to their creation using old book-binding methods. One version features street artist Curtis Kulig's famous "Love Me" design, which has our hearts all aflutter. To add to the cute factor, these rich red cases can feature either your babe's initials or your own. Just add your metered tribute of love to us in the comments below to compete for our affections. Now, don't go all Rime of the Ancient Mariner on us and write some epic poem or, worse, trail into NSFW territory. Keeping things short and sweet is the only way to win our love (and the DODOcase).